To record the PC screen effectively, there are different number of screen recording software being used which are available in online form as well. An online screen recorder is somewhat different from a desktop screen recorder in such a way that for the online one's, it is not necessary to install or download launchers and applications whereas for the desktop one's it is necessary to download and install the application and launchers that would take more space of the computer drive. In addition to this, most of the desktop screen recording software are paid ones where as the online ones are mostly free and come quite handy. As one of the best online screen recorders, FotoFriend Video Booth also offers the highest quality recording experience when you want to use a webcam-only screen capture. Using its built-in Video Booth option, you have the ability to use your webcam for video recording without any need to download any program to take space offline on your computer. In addition, with over 55 special effects right at your fingertips, Fotofriend is a perfect solution for making fun movies to share with your friends. Not only this, after recording, you'll be given a link of the recorded video by Fotofriend which is convenient for you to share the video with others. This is another one of the best and most advanced screen recorder that enables its users in recording videos by a click of button. It has gained its reputation and popularity among all online screen recorders thanks to the simplicity of its interface and design that bring ease at recording. With this smart app, you can record any screen activity with just a few clicks and directly upload it to the internet, which makes the program very straightforward to be used for your needs. 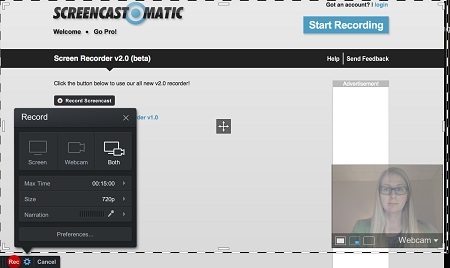 It's one of the best screen recorder specially for tutorial content creators and demo producers. Besides, as this online application runs on Java, it can also function offline if you choose to have it installed. Contains a built-in feature for editing videos and personalizing them. 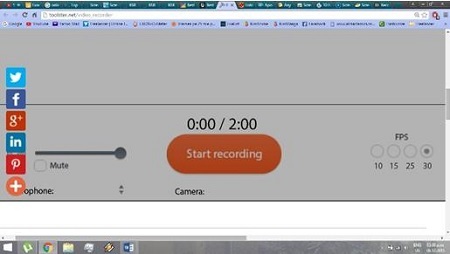 This is an online robust webcam-only screen recording application that enables you in recording the screen in a very easy way with the help of webcam. As a direct and efficient screen recorder, Toolster Video Recorder is able to record from your webcam without downloading any special software and dealing with complicated installation instructions. Therefore, anyone can operate it for recording without any hassle. The only requirement for this online webcam capture is Adobe Flash player. In order to record, you have to grant access to your camera and microphone (for audio) and click the Start recording button that will appear on your screen. Summing up as a whole, online screen recorders are one of the easiest solutions in recording desktop screen. However, they are still not considered the best in comparison to offline one as they have more features and are way faster. In addition to this, online recorders prove the best for the people with small task whereas offline ones prove the best for big task such as video tutorials. In case you are not satisfied with those online screen recording tools, we'd suggest you give a test with one of the best offline video capture, that is, Joyoshare Screen Recorder. It's capable of recording any desktop video activity with audio, including games, online movies, streaming music, webcams, video calls, social chats, speeches, etc. in high quality. And unlike the free online screen captures, Joyoshare supports saving your recordings in more popular formats and devices, such as MP4, MPEG, MOV, AVI, FLV, SWF, iPhone, Android, Xbox, smart TV, etc. It comes with a cleaner layout and more effects that every one can handle well. Here's the free trial version you can test by yourself.